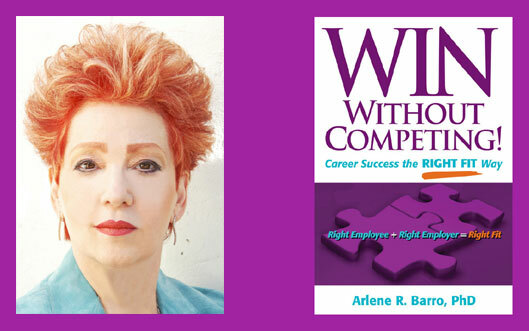 Personal Coach and creator of the Right Fit Method, Dr. Arlene Barro, is your Personal Advisor who shares her incite, advice and wisdom to help you achieve professional and personal success. Initially, I wrote WIN Without Competing! to explain step-by-step how to implement a unique method, the Right Fit Method, to achieve career success and demonstrate the need for employers to change their hiring practices. While writing the book, I realized that my Method could substantially change people's lives, which motivated me to write the final chapter "The Right Fit: An Approach to Life." Are you wondering why you are unhappy? Finding happiness for many is a puzzlement. In fact, at Harvard, students take a course titled "Happiness 101" which is designed to teach them how to build and maintain their happiness. From my perspective the way to achieve happiness is simple: determine what's important to you. Once you do that, begin to search for Right Fits in every aspect of your life. If you have been searching for Right Fits and finding Wrong Fits, I know why you have been unsuccessful. When we were children we learned to search for the "best." Unfortunately, when we search for the best we frequently select wrong fits. Perhaps you are perplexed. Picture a barrel of rotten apples that is rat-infested. If you compare and contrast the apples and then select one, what do you have? A rat-infested rotten apple. If the person you picked to marry is one of those rotten apples, you picked the wrong fit. You must search for the Right Fit. The question is how do you find the Right Fit? The solution is simple. You must learn how to create a blueprint. Curious? 310-443-4277 and tell me which scenario(s) describe(s) you. If no scenario matches you, tell me your story. To which question or questions would you respond "yes"? 1. Have you never married or have you been married many times and still searching? 2. Are you divorced once or widowed once and searching for the Right Fit spouse? 3. Did you find the Right Fit spouse or live-in relationship which then turned sour? 4. Are you an "unwilling" breadwinner or caretaker? 5. Did you have a Right Fit job which turned into "no job" causing financial hardship or a small business income which has significantly declined? 6. Are you dissatisfied with your lifestyle including living accommodations, location, and community involvement? 7. Do you have children that are not the Right Fit for you? 8. Are you searching for Right Fit friends? 9. Are you doing what people expect of you but are not satisfied with who you are? 10. Are you frustrated by weight gain and avoiding certain activities while awaiting weight loss? Plan Ahead! Make 2013 a Year of Right Fits! We create New Year's resolutions, planning to change our behavior and reach our goals. Sometimes we succeed, other times not. This year I suggest adopting the standard of the Right Fit in which you create blueprints of Right Fits. You will be amazed at how your success rate will improve! To put you in the Right Fit mindset, I suggest clicking here and reading Helen Hurst's story to learn how I coached her to turn her marriage around. She fixed the fit. Enjoy Dr. Helen Hurst's great story. To learn how to find the Right Fits in your personal life, let's talk. To assess your personal coaching needs, based on your scenarios, arrange a time to speak with me via phone 310-443-4277 or email.